First Aid is defined by SafeWork Australia as “the immediate treatment or care given to a person suffering from an injury or illness until more advanced care is provided or the person recovers.” Trained First Aiders perform a very vital function in providing first-level care until full medical treatment can be administered (if it is required). In this way, First Aid can help reduce the severity of an injury, and even save lives in some instances. First Aiders of course may also provide treatment for smaller injuries such as minor cuts, wounds and burns. There is no legal requirement for churches to provide trained First Aiders, but it is certainly recommended. In many churches there may often be a large numbers of people on the property at the one time, so it makes sense to have First Aiders on hand in case of sickness or injury. There is however a legal requirement for employers to have trained First Aiders in their workplaces. The type of skills required of First Aiders needs to provide a good ‘match’ for the identified hazards of the particular workplace. It’s also important that good risk management is conducted to reduce the risk of harm occurring at work in the first place. If your church has employees you should look into the legal requirements for First Aid – more information is available through SafeWork Australia or your State’s WorkSafe site. What is required of First Aiders? First Aiders need to hold nationally-recognised Statements of Attainment from a Registered Training Organisation (or RTO). They should also do refresher courses regularly to enable them to refresh their knowledge and ensure their skill levels are current. It’s also important that First Aiders do not perform care beyond their training and skill level. First Aid courses can be done through the Red Cross, St. John’s Ambulance and a number of other organisations. Some courses can be done online if required. It’s important that churches keep a record of accidents that occur on their properties. This helps in improving risk management, in the prevention of a recurrence of the same or similar type of incident, and in providing information to insurers if required. 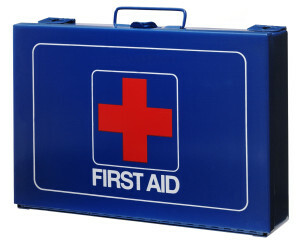 One of the main elements of First Aid is the First Aid kit. It is recommended that churches keep a well-stocked kit in case of injuries such as burns, scrapes or cuts. Kits should be checked and restocked regularly – every 2 to 3 months for instance. They should not contain any medications (e.g. paracetamol) due to the risk of allergic reactions for some individuals. The kit should contain a First Aid booklet, bandages, dressing pads, bandaids, gauze dressing, scissors, tweezers, disposable gloves, adhesive tape, ice-pack, saline solution, plastic bags, and notepad and pen. You can purchase kits from organisations such as the Red Cross or buy the contents and make up your own. For more information on First Aid kit requirements, see SafeWork Australia or the Better Health Channel. There are also risk management and safety mini-courses for Risk Management Officers, employees and volunteers available at our CCI website Training Page.